A significant challenge faced by the world is the aging of its population. According to Article 2 of the Law of the People’s Republic of China on the Protection of the Rights and Interests of the Aged, “In this Law, the elderly refers to citizens above the age of 60”. In 2000, the population above 60 around the world was 600 million, and it is expected that in 2025, the figure will reach 1.2 billion, and in 2050, 2 billion. Compared with the rest of the world, China faces a bigger challenge. 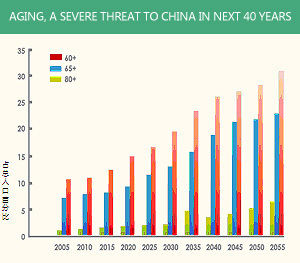 After China became an aging country in 1999, the degree of aging has increased significantly. According to the latest data published by the National Bureau of Statistics, in 2011, China’s aging population has reached 174 million, accounting for greater than 12.78% of the total. This includes 21.32 million that were above 80, accounting for 12.25% of the elderly. It is expected that in 2015, the above-60 aging population in China will rise to 216 million, accounting for about 16.7% of the total, and in 2050, the proportion will be 31%.